The Chicago Blackhawks player wearing #32 in this picture is Don Dietrich. 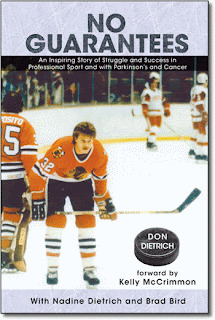 By all standards Don Dietrich does not rank as a Legend of Hockey. He played in just 28 NHL games in a professional career spanning a decade. He never scored a single goal, and picked up seven assists. People often ask me why I profile "lesser" players. Don Dietrich does not deserve a spot alongside Wayne Gretzky and Bobby Orr at a website called Greatest Hockey Legends. They may be right. But I do it because these players also have amazing stories to tell. Don Dietrich is the perfect example. Dietrich tells his own story in his autobiography No Guarantees. It is an amazing story on two levels. Firstly, it is a great hockey story. We have heard time and time again the often similar stories of the greats of the game. It is those stories that formulate the stereotypical hockey dream we all once had. But Dietrich's story is the far more common story. Most players who turn professional do not make it to the NHL. They play on in the minor leagues chasing the dream. Usually the only thing keeping them going is not the money or the glory, but the passion for the game. This describes Dietrich to a tee. And he has some incredibly entertaining stories to tell. Like ordering a steak with Doug Wilson and breaking in Phil Russell's gloves, to contracts and trades and an unbelievably horrible Olympic experience; From the lows of minor league politics to the glories of European leagues to the troubles of life immediately after hockey, Dietrich is very open and honest, making this is a very refreshing hockey book. "Dieter" is a great storyteller. He lacks a little polish and he could use an occasional fact check, but through it all he becomes a very lovable protagonist of the book, an underdog who the reader will find himself rooting for. That emotion becomes quite exacerbated as the book takes on a second focus late in the book though, leaving hockey behind. Dietrich is dealt one severe blow after another. First he is diagnosed with Parkinson's Disease, then two battles with cancer, the second one of the rarest and deadliest forms of cancer. Don Dietrich was not supposed to live much longer after the second diagnosis of cancer. That was well over a decade ago now. Through excessive medical treatments, strong family support and a stubborn determination, he has amazingly extended his life with inspiring positivity and dignity. Inspiring is definitely best term to describe this book. Must-read is another, for all hockey fans and even non hockey fans.